New University of the Virgin Islands Women’s Basketball coach Reggie Carrick came on Tortola on Saturday with blank scholarship offers in his bag, and, to look at female players that Derwin Scatliffe had invited him to see. 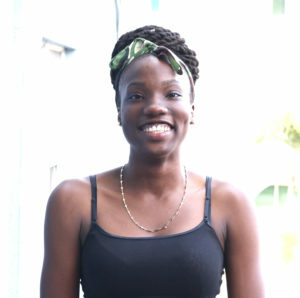 Joy Victor walked into the Multipurpose Sports Complex and walked out making history as the first BVI female basketball player signing to play with UVI. Carrick said he had been speaking to Derwin Scatliffe who’s currently coaching the BVI U17 team for the upcoming Centrobasket Tournament for a while and they had been trying to arrange his visit but his schedule didn’t allow it until over the weekend. The players Carrick were looking at were working along the U17 female players who are preparing for Centrobasket. He said he can see why the BVI, especially for girls basketball, is starting to get a reputation as a place to come and recruit because there are some talented ladies here. Scatliffe said the new developments at UVI, gives most of the upper class kids in the BVI and opportunity to be exposed and possibly be recruited for next year. He said girls who never had a chance to play overseas or at any level in the USA before, they’ll now have an opportunity to play at UVI. “They’ll get an education and hopefully be seen by anyone out there, WNBA or whatever, it makes an opportunity for everybody,” he said. Regarding the program he’s developing at UVI, Carrick said they got started late. He said sometimes it’s not a problem if you’re coaching men’s basketball. Women he said are more pragmatic than men and they tend to have a plan. He added that this time of year, there aren’t too many girls that don’t have a plan. Among players coming in is a Division I transfer point guard and there are players already in the fold from St. Croix. He said they will be competitive right away.